From a bat up a lamppost to a dog inside a pool table, South Yorkshire Fire and Rescue has had some odd requests to help save animals in the last three years. Dogs caused the most number of call-outs with 61 incidents requiring 285 firefighters to spend their shifts hauling the animals out of badger holes, pool tables and drainage pipes. Other creatures saved from perilous situations from April 2013 to March 2016 included sheep, snakes, badgers, cats, horses, a bat, a squirrel, swans, hawks, a bull, a guinea pig and fish. Cats were to blame for 60 call-outs, 17 of which involved a cat being stuck in a tree. Only 48 horses needed rescuing but due to their size 321 officers were needed to save them. The most bizarre incident was when five officers spent an hour and a half rescuing a bat that had become stuck up a lamppost in Doncaster in May 2013. Firefighters were called to Castle Street, Conisbrough, after a bat became entangled in fishing wire up a lamp post. A bat conservation specialist helped the crew who used a ladder to rescue the bat. Similarly perplexing was the dog who had to be sawn out of a pool table in a pub in Sheffield in August last year. 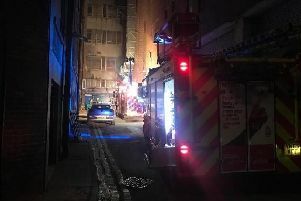 At around 1.30am firefighters were called to the White Hart pub on St Philip’s Road, Netherthorpe in Sheffield. Sonny the springer spaniel had been underneath the table when his head became stuck in a hole. Other weird rescues include five firefighters spending 36 minutes freeing a dog’s paw from another dog’s collar, ten officers rescuing two ducks that had been covered in kerosene, and a fire crew breaking a snake out of a wall cavity in Barnsley. Call-outs to rescue animals took a total of more than 500 hours to resolve. Cat rescues took a whopping 270 hours while horse and pony rescues took 80 hours, dogs 66 hours and birds 33 hours. Head of emergency response at South Yorkshire Fire and Rescue, Tony Carlin, said: “Animal rescues are an established part of fire service work that’s greatly valued by the communities we serve. “Rescues performed by firefighters with specialist training and equipment stop the public getting into danger by attempting rescues themselves. “These incidents also highlight that firefighters contribute far more to local communities than simply putting out fires. There has been a 25 per cent decrease in animal rescues over the last three years.